Considering Commercial Aquaculture in South Africa? 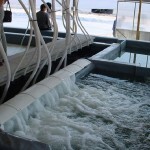 If you are considering commercial freshwater or marine aquaculture you have come to the correct website. Commercial aquaculture depends on land, water resources, markets and an honest assessment of the size of aquaculture development being considered. Smart Farming offers sustainable turnkey projects. We have done over 30 state-of-the-art commercial projects around the world in the last 15 years and every one of them is still running. Contact us to get started! We are a South African company located in Cape Town, South Africa. Over the past decade, powerful forces have been leading the aquaculture industry to the use of Recirculated Aquaculture Systems (RAS). Among the motivations for this RAS Revolution are the global shortage of fresh water, contamination of water sources, higher environmental awareness and rising land prices in developed countries. Our system is a RAS, based on the efficient recirculation of water in grow-out tanks. A series of airlift pumps supply oxygen to the water, while also removing carbon dioxide. It is an almost-closed system, which minimizes the need for a continuous fresh water supply while at the same time conserving energy costs. It also provides for treatment of wastewater and the removal of solid waste. The simplicity of design is its hallmark. Simplicity lessens the number of moving parts and thus the need for human involvement, reducing maintenance costs, the potential for clogs, and other system failures. Our mass water flow system has broken the density limit for aerated recirculated aquaculture systems, achieving production densities comparable to those achieved in pure oxygen systems. Several components work together to achieve the goal of very high density at an affordable investment and low operating cost. Two world-wide patents protecting the technology are pending. The initial investment for this system is between 20% and 35% less than other conventional RAS systems. The actual savings varies based on the species raised, the size of the production facility, and local economic conditions. -Our system achieves the higher production levels of LOX systems without using liquid oxygen! -Our system users are saving between 15 and 30 cents per kilogram of product in associated oxygen savings. -Our system is a low-head system, reducing the energy needed to pump the water. In addition, airlift operation can be stepped up or down to conform to biomass needs. The system producers are saving between 25% and 60% per kilogram in electricity costs. -Our system has no moving parts to maintain. It’s as simple as that! -Less maintenance means fewer people are needed to do it. -Our system has proven its efficiency both in preventing diseases and in fighting diseases efficiently when they are already present. -Our system can be up-scaled while still maintaining a single power input. With these clear and strong advantages, why would you choose anything else? In actual use, our mass water flow system has been proven to surpass the density limitation for aerated RASs. It achieves performance levels comparable to that of pure oxygen systems but at a lower cost. The core of the system contains a high-efficiency airlift, producing a bubbly flow, enabling an efficient oxygen transfer regime. This new device provides a steady supply of dissolved oxygen, combined with CO2 stripping and water motion in the culture tanks. In each rearing tank, a battery of such airlifts is installed, producing a flow capacity measured in hundreds to thousands of m3/hr. Dividing the workload among several airlift units allows for a stepped operation that conforms to the growing needs of the biomass, avoiding energy waste. Each rearing tank in our mass water flow system is designed as a closed-loop container, allowing a uniform quasi-laminar flow of water. The tanks have two main zones, the culture zone, and the airlift pit. The aerated water flows from the airlift pit through the culture zone where oxygen is respired, creating the highest oxygen gradient for the airlift operation. The minimum oxygen concentration is not allowed to drop below a preset value that would hinder fish growth. Our system’s practical oxygenation span is on the order of 1 to 3 ppm and usually not less than 70% of saturation. These values were measured at the end of the closed loop, suggesting that average conditions are closer to saturation. Throughout the culture zone, water velocity is kept at a convenient speed for the reared species. The cross-section area of the rearing tank is designed for maximum oxygen consumption. The width of the tank controls the maximum output of the airlift battery, while the depth controls the maximum average velocity of the water. The length of the loop has no effect on the rate of oxygenation or the water velocity. As in pure oxygen-enriched systems, maximum rearing density is not limited by oxygenation. The CO2 stripping rate at practical limits (8 ppm) exceeds the oxygenation rate, meaning that complete aeration is achieved with the same apparatus. In addition to its key operating features, the system incorporates modules that monitor water quality and flow, feed consumption, electrical supply, and animal health, among other attributes. Our mass water flow system contains back-up controls that seek to isolate problems so that they do not affect other system elements. The recirculation aspect of our mass water flow system involves four cycles: oxygenation and degassing, nitrification, solid waste removal, and denitrification. The first two cycles are relatively fast, while the last two are slow and measured in days. The nitrification cycle replaces ammonia, which becomes dangerous for the fish at low concentrations, with nitrates, which can accumulate safely in the culture water at much higher concentrations. Nitrates are treated partly in the denitrification cycle where they are reduced to nitrogen gas at the anoxic condition and while using the solids evacuated from the ponds by the solid waste removal cycle. New water is used mainly for temperature control and replenishment of evaporation and operational losses. Water is added at a rate of about 3% to 15% of system volume per day. Effluent is released to the environment after final treatment in a denitrification pond, with long retention time, which ensures low TSS and reduced nitrate in the effluent. Our system has much less impact on the environment compared to conventional aquaculture systems. All water exiting in the system is processed to surpass local environmental protection standards. Aquaculture is one of the world’s fastest-growing industries. Forecasts show it will continue to be a major growth industry well into the 21st century. Consumption of seafood products is on the rise while at the same time global supply is constrained by limitations on the harvest in the wild. As a result, aquaculture production has expanded tremendously in many regions of the United States and worldwide. Over a nine-year period, world aquaculture production has increased by 85 percent, from 19.4 million metric tons in 1992 to 34.9 million metric tons in 2002 (seaweeds included), to an annual value of $62.5 billion (FAO 2003). Based on population growth projections and projected continued growth in seafood consumption, global seafood demand is expected to increase by more than 60 percent over the next 30 years (Parker 1995). The Future is in finfish. Since harvest from wild fish stocks is approaching or has exceeded maximum sustainable yields, aquaculture production will have to increase approximately 500 percent to meet global seafood demand in the year 2025 (Parker 1995). A major part of this increase will have to come from finfish aquaculture. If world average fish consumption is to stay at 13.6 kg. per capita per year, worldwide production of finfish aquaculture will have to double itself to 45 million metric tons a year in less than 2 decades. Over the past decade, powerful forces have been leading the aquaculture industry to the use of Recirculated Aquaculture Systems. Among the motivations for this RAS Revolution are the global shortage of fresh water, contamination of water sources, higher environmental awareness and rising land prices in developed countries. To be competitive in a market such as this one, where prices are almost fixed across the board, costs must be cut to the bone. Our mass water flow system was developed to answer this need. Whether in a pond, a stream, or a tank, all aquaculture must ensure that the amount of dissolved oxygen in the water is sufficient to allow the product being raised to live. More than that, by optimizing the amount of dissolved oxygen, production can be increased and time to market can be decreased. Many methods for increasing oxygenation rely on conventional aeration apparatus, such as paddle wheels, surface agitators, or air diffusers. These, however, are too limited to achieve maximum rearing density. This is due both to the limited oxygen gradient between saturation and the minimal acceptable oxygen concentration and to the maximum acceptable velocity and turbulence created by the aeration apparatus. The use of oxygen enrichment from liquid oxygen sources or oxygen generators is able to achieve higher rearing densities, but it comes at a price. It is usually expensive and requires high-energy inputs to dissolve the oxygen in the water as well as to strip off the carbon dioxide created by respiration. In today’s competitive environment, to be successful you must reduce operational and investment costs, while at the same time achieving the highest possible rearing densities. With conventional methods, you can choose lower costs or maximum densities, but not both together. Contact us to get more information on how to get started with aquaculture or to find out about our aquaculture systems and tanks for sale. If you are interested in freshwater prawn farming make sure to give us a call as well.